Mum used to cut our hair when we were small, but once we had reached the age of five and started school it had to be done properly, and I remember one of my first visits to the barbers. I sat in my chair awaiting my turn, watching the young Italian barber cutting hair as he chatted to all the customers in the shop. Even when he was not actually cutting hair, but just talking, his fingers would not stop working, with the scissors going clickety-click constantly. 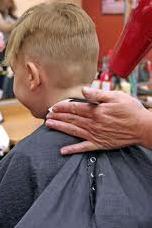 I was fascinated by this, watching the closeness of those uncontrollable flashing blades so near to the customer’s head, whilst the young barber spoke to a particular customer in the shop, with his funny way of talking, and that flashing Italian smile. Eventually it was my turn, and I was praying that nobody would speak to him whilst he cut my hair. He put a wooden plank across the arms of the chair, and invited me to sit on it, calling me something like bambino and in the mirror I watched his hand holding the scissors, and I could swear it was twitching as he put the green sheet around me, and it was awfully close to my right ear as he tucked it in. I watched him in the mirror, and he frequently looked at customers as he spoke to them, with his scissors still clicking away. Suddenly in the open doorway, I could see reflected in the mirror, a young Italian girl, who worked in a cafe nearby. She was in the full sunlight, leaning up against the door post, in a stance which I would later learn was called provocative, with one leg bent and her foot resting against the door post. She had long black hair and sparkling eyes, and from the moment my barber saw her, he never took his eyes off her, talking to her, with those scissors going even faster, and as his hand moved around my head without looking at me once. I feared for my ears and nose. The boy sweeping up loose hair, also seemed to be mesmerised by this danger, and kept staring at my head. I awaited my opportunity, and throwing the cover down I leapt from the seat and ran out of the shop like an evading rugby player. I could still hear the scissors clicking as I walked away, trying to think up some excuse for having only half a haircut. I realised that the man was ill, and he was suffering from that form of madness that my brothers had told me about. It was the first time that I had ever seen anybody who was 'Madly In Love', and I vowed that when I grew up I would make a law, that barbers if they suffered this form of madness they would have to stop being barbers. It was just too dangerous for small boys.